Earthsky Tonight—March 10: Is Sirius the most luminous star in the sky? Yes, Mia, you are right. Sirius looks extraordinarily bright in Earth’s sky because it is only 8.6 light-years away. Many stars on the sky’s dome are intrinsically more luminous than Sirius, but appear fainter because they lie farther away. Apparent visual magnitude refers to a star’s brightness as seen by the eye from Earth and absolute visual magnitude measures the star’s brightness as it would appear to the eye at 32.6 light-years away. 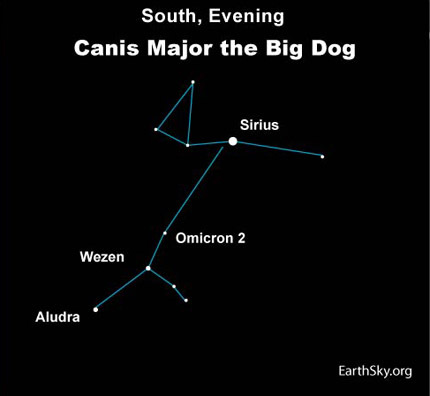 At least three stars in the constellation Canis Major are thought to be thousands of times more luminous than Sirius: Aludra, Wezen and Omicron 2. Although the distances to these faraway stars are not known with precision, Aludra and Omicron 2 reside an estimated 3,000 light-years distant, and Wezen at 2,000 light-years. At 32.6 light-years away, our sun would barely be visible as a speck of light, but Aludra, Wezen and Omicron 2 would outshine Sirius by some one hundred to two hundred times. At 32.6 light-years, Sirius would be about the same brightness as the Gemini star Castor. Site contents copyright © 2019 Recorder Online	except as noted. All rights reserved. | 83 queries in 1.314 seconds.